I would like to share good news to all Test Automation engineers over there. Google has announced Google Test Automation Conference (GTAC) on April 23 and 24, 2013 at Google New York office. 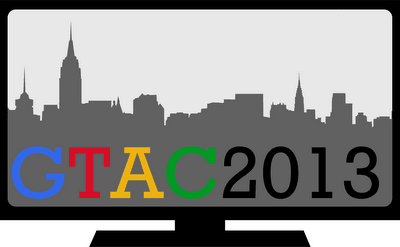 Google is now accepting proposals and attendance for GTAC. Conference will be live at YouTube. There will be full presentations for 45 minutes and lightning talks for 15 minutes. This year theme is “Testing Mobile and Media“. Google accepts proposals from the other topics as well. Visit Google Form to submit your details. Google will be selecting about 200 applicants. Selected applicants will be notified via email. Last date to submit your proposal or attendance is Jan 23, 2013. There is no registration fee. Meals will be provided at venue. Travel and accommodation should be take care by the attendees. Why waiting? Fill this form and get selected. For more details please visit Google Testing Blog or GTAC. Subscribe to our QAInsights YouTube Channel. If you are enjoying our work, please do subscribe our free weekly newsletter or Google feeds.